The death toll in a week-long eastern Canadian heat wave has reached 54, officials said on Friday. Most of the victims linked to the "overwhelming heat" were in the Montreal area, which recorded 28 fatalities, metropolitan health authorities told AFP in an email. The other victims were reported in the southwest of the French-Canadian province, the Quebec health ministry said. On Thursday, Environment Canada had forecast a maximum temperature of 35 C (95 F) but said the heat index would make it feel like 45 C.
The mercury has since June 29 regularly topped 30 C, accompanied by stifling humidity levels, but temperatures should drop back to seasonal averages from Saturday. "Looking at the weather forecast, we are waiting for a return to normal in the coming hours," said Health Ministry spokeswoman Noemie Vanheuverzwijn. 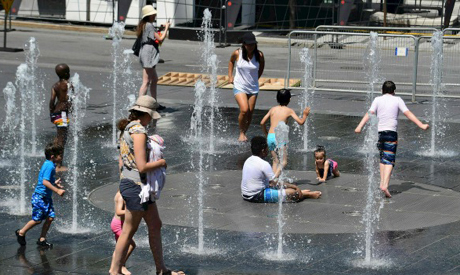 Most of the victims in Montreal were men in their 50s or older, and living in vulnerable conditions without air conditioning, regional public health director Mylene Drouin has said. Neighboring Ontario has also been coping with high temperatures but no deaths have been reported there. In 2010, around 100 people in the Montreal area died when extreme heat stifled the area.